Qld bans Underground Coal Gasification, yet SA is to embrace it!! One company is proposing to use new technology to “gasify” the brown coal resource at Leigh Creek and use it for a large base load gas plant. Underground coal gasification has been banned in Queensland, but the South Australian government does not plan to follow that example. “There is no need to politicise this process – the approval or otherwise of the proposed coal gasification project at Leigh Creek should be based on science,” Energy and Mineral Resources minister Tom Koutsantonis said in a prepared statement for RenewEconomy. http://www.protectlimestonecoast.org.au/wp-content/uploads/2016/05/Linc-Energy-1-e1465926826584.jpg 398 800 LC Updates http://www.protectlimestonecoast.org.au/wp-content/uploads/2018/02/Logo-1.jpg LC Updates2016-05-25 22:13:182016-06-15 03:44:32Qld bans Underground Coal Gasification, yet SA is to embrace it!! DEA is an independent health advocacy organisation of medical doctors addressing the health impacts of environmental damage. Last Friday’s report into the former Queensland government not only exposes the inadequate regulation and approval processes for coal seam gas and coal mining in Queensland, but also the failure of the state’s leaders to put the health of their constituencies first, according to a leading medical group. Doctors for the Environment Australia is calling on all major parties to support wide reforms to protect Queenslanders from CSG and coal mining, both of which pose significant threats to the health of Queenslanders. 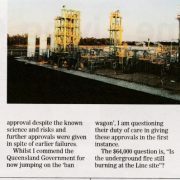 Says DEA spokesperson and Brisbane GP, Dr David King, “it’s most unfortunate, given the health impacts, that Liberal Senator Ian Macdonald dismisses the entire report and the Labor Senators continue their support for fossil fuel industries by opposing a moratorium on new approvals for coal seam gas. In its report, the inquiry made 20 recommendations which included a moratorium on new CSG approvals in the state, a ban on fracking and also recommended the state review all mining decisions made under the Newman government where environmental laws “may have been ignored” or where “potential conflicts of interest” or political donations “were involved in some way”. DEA supports the inquiry’s main recommendations, and in particular the need for a royal commission for this will investigate the human health impact of coal seam gas mining and allow the government to wipe the slate clean of many mistakes by both recent state governments. DEA’s recent submission into the Queensland Government administration made a scathing critique of the lack of process associated with fracking projects in Queensland. There was a lack of data, a rushed and grossly inadequate environment approvals process, insufficient evidence about health outcomes and poor regulation of existing wells. DEA’s main concerns centre on CSG’s production of large quantities of potentially contaminated water by chemicals used in, or generated by CSG mining. Many of these chemicals are known to have adverse, long-term health effects, including endocrine (hormone system) disruption, fertility and reproductive effects, and development of cancers. Internationally, there is growing evidence that fracking has contaminated groundwater and caused air pollution and the potential long-term health effects are starting to be detected. In the US scientific literature shows an increased prevalence of heart defects in children whose mothers lived in close proximity to gas fields. However, there has been no systematic evaluation in Australian of potential health impacts for those working or living in proximity to CSG mining, a major omission in the approval and monitoring process of mining developments. DEA highlighted several examples of failure to adequately monitor wells. In the case of the Santos GLNG project in the Bowen and Surat basins, the 2013-2014 half- year report from the Department of Environment and Protection showed that out of a meager target of ten inspections for the period, only one inspection was completed. Dr King, says, “The Government’s abysmal performance in this matter suggests it has thrown caution to the wind. As doctors, we’re deeply concerned about what this means for the wider community, particularly those living close to wells, and we urge the Federal Government to implement greater regulation on the fracking industry in Queensland. “As doctors, we call on our leaders to put public health first- it’s critical that we follow the precautionary principle in any new development, rather than rush headlong into practices with possible adverse health effects purely for short term profits, ” says Dr King.